On the afternoon of Wednesday, February 15, representatives from the District Department of Transportation (DDOT), the District Department of the Environment, and the Office of Planning, continued a design charrette or a community work session, which began Monday, February 13. 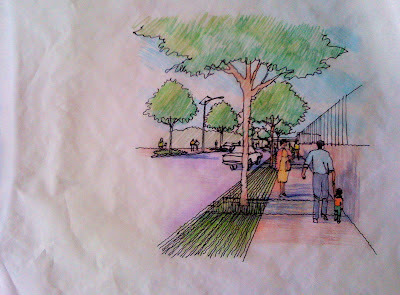 The Wednesday meeting offered the public the opportunity to comment on the initial sketches from suggestions made during Monday's meeting and ask questions about pedestrian and bicycling amenities. 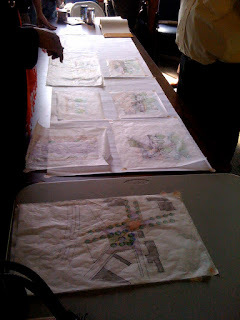 According to the DDOT website, the project hopes to create a public space that connects the Metrorail station to neighborhood assets, makes the area safer for pedestrians and bicyclists, better manages local storm water runoff and complements upcoming economic development projects in the community. Greater Greater Washington contributor, John Muller, offers a more pedestrian-focused view of the project; specifically, how the cerrent conditions are among worst in District for pedestrians. 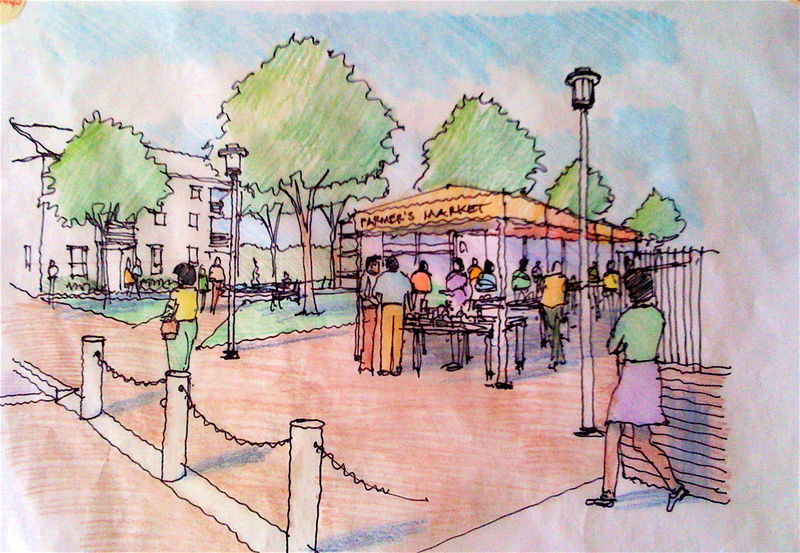 This Charrette is a product of the District being recently selected as one of five capital cities to receive technical design assistance from the US Environmental Protection Agency’s (EPA) Greening America’s Capitals program in 2011. The EPA hopes to enhance pedestrian / bicycle safety in the public spaces surrounding the Anacostia Metrorail Station and to “green” the community through park and recreation areas, improved water and air quality, and community health benefits. According to the EPA website, "the design team's areas of focus will be safety concerns at the intersections, improved signage, increasing the overall permeability of the area to manage stormwater, and creating a strong community identity". Figure 1 shows the re-imagined intersection of Howard Road SE and Firth Sterling Avenue SE in the northerly direction. Anacostia station is represented by the box with the blue trim . 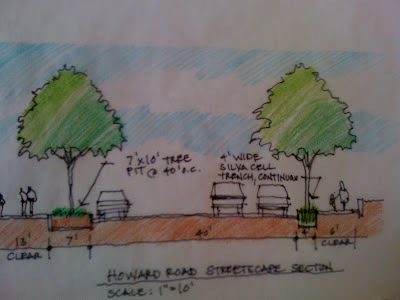 In front of the station, the designers envision a 100 foot wide pedestrian crosswalk across Howard Road that leads to a small park-like area on Shannon Place SE. One of the more bicycle-specific elements of the design would include elements of the South Capitol Street Environmental Impact Statement; specifically, the extension of the Suitland Parkway trail across Martin Luther King Jr. Avenue SE. 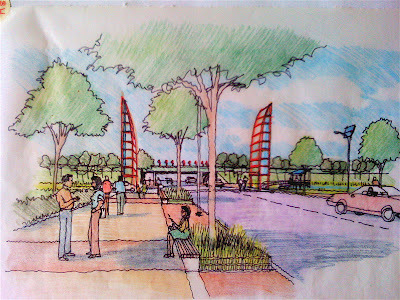 The charrette presenters design assumes the construction of a center-ramp interchange at the Suitland Parkway and Martin Luther King Jr. Avenue SE. This will presumeably allow the trail to run parallel the current Parkway alignment between the Anacostia Station and the Parkway - extending to Firth Sterling Avenue then to Howard Road. Buses would be diverted off of Howard Road, entering and exiting on Firth Sterling Avenue. 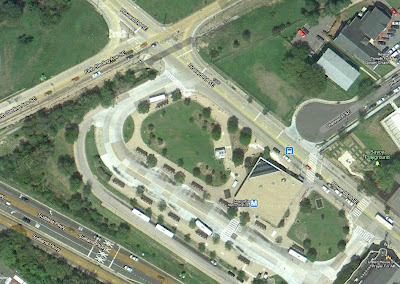 Not see on this map, would be a exit for buses on Martin Luther King Jr. Avenue SE. WMATA has not been contacted regarding this suggestion. Figure 2 shows the area as it currently appears today. Buses enter and exit Anacostia Station at the corners and run along Howard. The bulb turnaround at Shannon Place SE has a traffic bump to allow public safety to access the street. However, unauthorized vehicles consistently use Shannon Place as a cut-through to avoid the traffic queuing to turn on to Martin Luther King Jr. Avenue. This presents a safety hazard for pedestrians and bicyclists who use this area as a walkway to the neighborhood and Thurgood Marshall Academy Public Charter School. At 90 feet, the bulb turnaround is also too wide. Figure 3 - Farmer's Market anyone? To eliminate the cut-through problem and reuses the space for other purposes, the designers removed the turnaround and replaced it with a small pedestrian park. Figure 3 shows the installation of bollards assessable only to public safety. This area would allow for events such as a farmers market or other programming. Other suggestions included adding more Bikeshare, bicycle parking and potentially convert Shannon Place, which runs roughly parallel to Martin Luther King Jr. Avenue, into a bicycle boulavard along its entire length. Figure 4 shows the north side of Howard Road SE facing westerly with I-295 in the distance. To the right is a retaining wall that abuts Thurgood Marshall Academy Public Charter School. The designers would like to widen the sidewalk to at least 10 feet in part by creating a silva cell, which is a steel pavement system that allows grass to grow yet provides a walkable, ADA-compliant surface. As shown in figure 1, the silva cell path would extend across the closed Firth Sterling Avenue SE into the water retention pond. 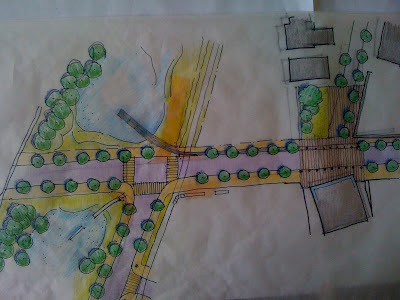 The design suggests that the utility polls and traffic control box would be removed or buried. Currently, this 6 foot section of the sidewalk is actually reduced to a little as 2 feet in some areas do to utilities and signage. The presenters estimated that bury utilities could cost about $1 million per mile. Figure 5 shows the Howard Road street scape cross section, the Thurgood Marshall Academy to the left. The street would 40 feet wide and appears to continue to maintain two vehicle travel lanes in both directions and no bike lanes. Removing one vehicle travel lane and creating a contra-flow lane on the left could increase the likelihood of traffic calming and the promotion of a more pedestrian and bicycle-friendly street. Two of the remaining vehicular lanes would be travel lanes while the third could be a turning lane near each end Howard Road. Figure 6 provides an overhead view of the Howard Road. 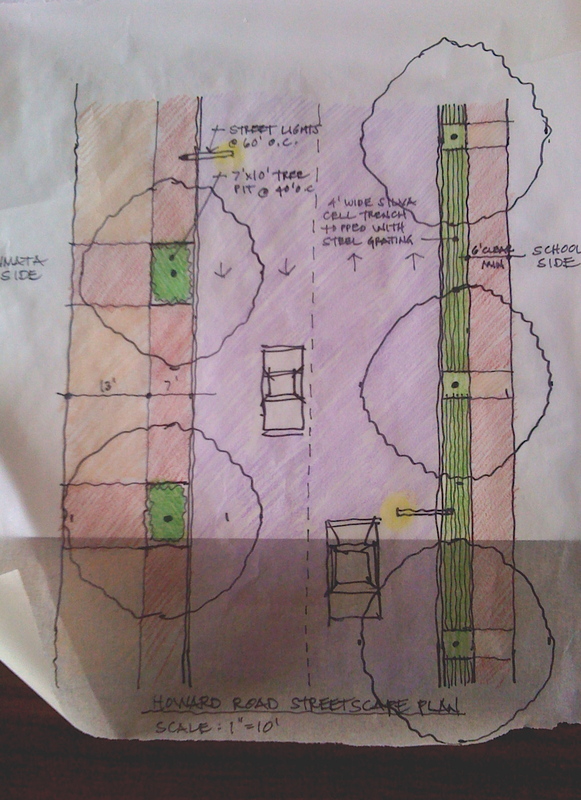 This picture shows the proposed widening the WMATA sidewalk to 20 feet and the school sidewalk to 10 feet, adding tree boxes, and new pavement. While 10 and 20 feet for sidewalks seem wide, it does not appear to be sufficient given the number of potential pedestrians who are crossing and walking along the sidewalk in front of the station or the school, respectively. Bicyclists would likely travel 'vertically' along Howard Road at speed and along Shannon Place. The Figure 6 view clearly shows the four vehicle travel lanes. While the presenters stated that changes regarding the reconstruction of the Suitlan Parkway and the elimination of the I-295 on ramp at Firth Sterling would reduce automotive traffic, the street appears to still be too car focused. 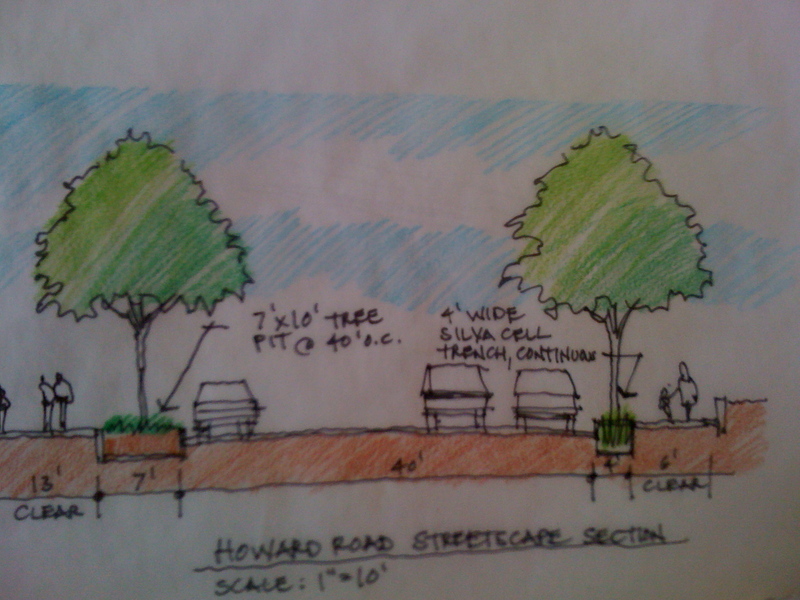 Figure 7 shows a typical street scape of Howard Road after reconstruction, just past the station entrance. The red towers on each side of the street are lighted solar-powered decorative art, which act as a visual anchor. Also, the street would be eluminated by solar-powered street lights. In addition, when viewed from the street, the Washington Monument is framed in the center. In the distance along the I-295 overpass, the designers hope to install small read wind-powered generators that would be used to eluminate Howard Road under the I-295 bridge. If you have questions or comment, feel free to post them below.